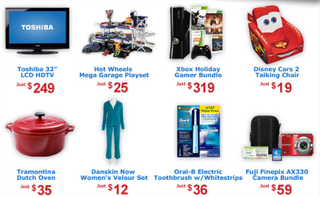 Starting Nov. 27, "Cyber Week" gets underway at Walmart. So before you rush out to the stores, you might want to look at the deals Walmart is offering. Namely, the Xbox 360 "Gamer Bundle". According to Walmart, the bundle comes with a "choice of select game plus bonus Halo: Reach, Fable 3, and a 3-month Xbox Live card". According to Walmart's Cyber Week preview site, one of the "select bonus" games available looks to be Batman: Arkham City, making this a good deal indeed and a better one that the retailer's current holiday value bundle. There are other items (ooooooh talking chair car!) on the Cyber Week preview page. Cyber Week wraps up Dec. 2, but your memories of it live on and on.